Although we are now several years beyond the housing crisis, the recovery in U.S. cities has been uneven. Low mortgage rates and strong economic fundamentals have spurred explosive growth in sales and construction in cities like Denver and Seattle. In other areas, however, the market is tepid and prices remain well below the highs they reached last decade. These trends can have an especially strong effect on real estate agents, whose livelihoods depend on a good sales environment. 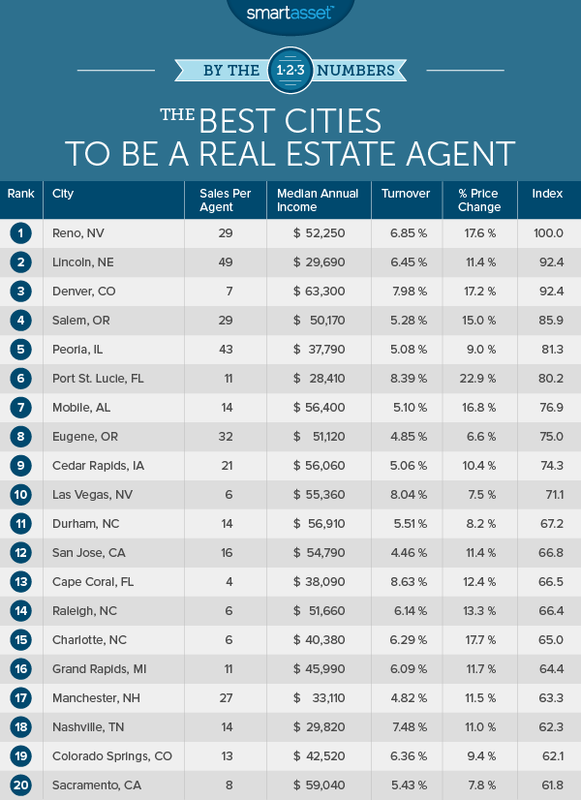 So where are the best cities for real estate agents right now? This is SmartAsset’s 2015 study of the best cities for real estate agents. View the 2016 study here. Hot markets help Reno, Lincoln, Denver move up. The top three cities in this year’s study all made gains over 2014 thanks to hot housing markets. Reno took the first spot after ranking second in 2014. Lincoln saw the biggest increase, moving up 10 slots from its ranking of 12th last year. Big cities slide. In 2014, several of the country’s largest cities ranked among the best locations to be selling real estate. This year, New York, Chicago and San Jose have been replaced by mid-sized cities such as Lincoln, Nebraska and Mobile, Alabama. West tops the Northeast. Five of the top ten cities for real estate agents are in the west, while none are in the northeast. In fact, the highest ranked northeast city is Manchester, New Hampshire. It appears at 17th in our ranking. For each of these four metrics, we calculated the number of standard deviations above or below the mean for each city in our study. We then totaled and normalized this scores from 0 to 100 for each of the 113 cities in our study. After ranking second last year, Reno claims the top spot in 2015. Why? Largely because the Reno market remains hot. According to the National Association of Realtors, the median home sales price in the Reno-Sparks market increased by a 17.6% from the first quarter of 2014 to the first quarter of 2015. There are two reasons that’s great news for real estate agents. Firstly, since real estate agents are typically paid a commission based on the value of the home, higher home values mean higher commissions. Secondly, price increases are typically reflective of a competitive market, with lots of buyers trying to get in on the action. That means real estate agents in Reno have plenty of eager customers. 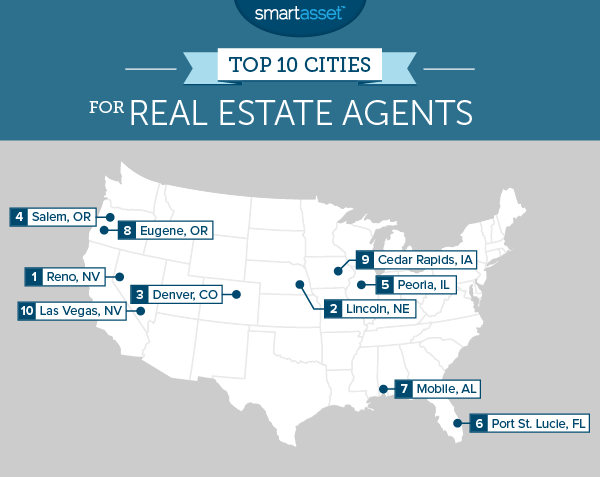 Lincoln is making its first appearance in SmartAsset’s ranking of the top ten cities for real estate agents. Among the reasons real estate agents in Lincoln are thriving are the high turnover rate (more homes are being sold each year) and high rate of appreciation. Buying a home in Lincoln? Find out what your closing costs will be. According to Zillow, 6.45% of all housing inventory in the Lincoln market changed hands in 2014. That contributed to price growth of 11.4% from 2014 to 2015. Real estate agents in Denver earn a median income of over $63,000 per year, according to the Bureau of Labor statistics. That’s the third highest income for real estate agents of any city in our study. Denver’s housing market is also among the hottest of any major U.S. city. Home prices in the Mile High City increased by 17.2% over the past year, according to the National Association of Realtors. Salem is the capital city of Oregon and the third largest city in the state. Though the housing crisis lingered in Salem into 2012, the city’s recovery is now in full swing. The median home price in Salem has increased by more than $40,000 since 2012. Home prices in Peoria actually declined from 2012 to 2014, reaching a low of $96,500 in the first quarter of that year. (Prices that quarter were also hampered by the harsh winter weather.) They have since begun to recover, climbing 9% between 2014 and 2015. Located along the Atlantic coast in south Florida, the Port St. Lucie area is a popular choice for people looking to relocate from the north to a warmer climate. The median home price in Port St. Lucie is $172,000 according to the National Association of Realtors. This can make it a bargain compared to nearby Miami, where the median home price is $269,100. Port St. Lucie had the second highest turnover rate of any city in the U.S. in 2014, at 8.39%. The median annual income for real estate agents in Mobile is $56,400, 11th highest of any city in our study. Combine that with a cost of living in Mobile that is well below the national average, and you can see why it’s great to be a real estate agent in Mobile. As home to the University of Oregon, Eugene has a relatively stable base of jobs. So, while the housing market in Eugene has been relatively steady as compared with the rest of the top ten cities in SmartAsset’s ranking, incomes for real estate agents in Eugene are still high. The median income for a real estate agent in Eugene is $51,120, according to the Bureau of Labor Statistics. As of June 2015, the unemployment rate in Cedar Rapids was just 3.7%, well below the national rate. When unemployment is that low, it generally means more households have a reliable source of income and more potential homeowners can start to think about buying. After ranking first in last year’s study, Las Vegas takes the 10th spot in 2015. What happened? In short, the housing market in Vegas slowed down. The appreciation rate of 24% from 2013 to 2014 slipped to 7.5% over 2014 to 2015. Likewise, the turnover rate fell from 10.2% to 8.4%. This isn’t necessarily bad news. As residents of Vegas found out during the housing crisis, an overheated market can lead to dire consequences when the boom goes bust. Most homeowners and real estate agents would prefer a market that cools off gradually to one that abruptly freezes. Read the 2016 version of SmartAsset’s study of the best places to be a real estate agent. 1. Data used in SmartAsset’s study comes from Zillow, the National Association of Realtors, the Bureau of Labor Statistics and the U.S. Census Bureau’s American Communities Survey.